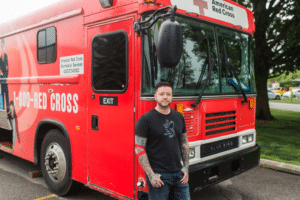 Drew Thomas began giving blood when he was in college, but when he started getting tattoos, he assumed he could no longer give. That’s a common myth – one that Drew, who now owns a tattoo studio, is hoping to help to dispel. 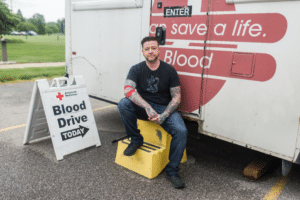 For the past three years, Drew has hosted the Leave Your Mark blood drive with the American Red Cross at his tattoo studio in Portage, Indiana. 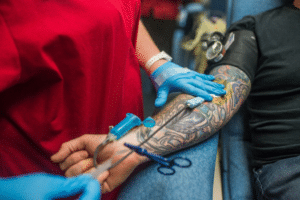 So, what are the facts about tattoos and giving blood? How long do I have to wait to give blood after getting a tattoo? In most states, you may be eligible to give blood immediately after getting ink as long as the tattoo was applied by a state-regulated entity using sterile needles and ink that is not reused. Are there any states where I can’t give blood after getting ink? Currently, the only states that DO NOT regulate tattoo facilities are Georgia, Idaho, Maryland, Massachusetts, Nevada, New Hampshire, New York, Pennsylvania, Utah and Wyoming, as well as the District of Columbia. This doesn’t mean you can’t give blood, just that you might have a deferral period. Potential donors should discuss their particular situation with the health historian at the time of donation through the Red Cross. What if I got my tattoo in one of the states that doesn’t regulate tattoo facilities? While your tattoo may be permanent, the deferral isn’t. If your tattoo was applied in one of the 11 states that do not regulate tattoo facilities, you must wait 12 months before donating blood. This requirement is related to concerns about hepatitis. Learn more about hepatitis and blood donation. To learn more about eligibility criteria for donating blood, visit redcrossblood.org or call 1-800-RED CROSS (1-800-733-2767). So, roll up a sleeve, show us your ink and give the gift of life. Are there blood donor tattoo designs available out there now?? Why Can’t you donate plasma if you have had a tattoo in the past 12 months? Hi Debbie, you should wait 12 months after you get a tattoo if the tattoo was applied in a state that doesn’t regulate tattoo facilities. You can find more information here: https://www.redcrossblood.org/donate-blood/how-to-donate/eligibility-requirements/eligibility-criteria-alphabetical.html. Hi. So I got a tattoo in Florida on the 2nd and was wondering if I could give blood in Georgia at my school on the 23rd because of the shop being a regulated one. Hi Sabrina, you would only need to wait 12 months after a tattoo if the tattoo was applied in a state that does not regulate tattoo facilities. Currently, the only states that DO NOT regulate tattoo facilities are: District of Columbia, Georgia, Idaho, Maryland, Massachusetts, Nevada, New Hampshire, New York, Pennsylvania, Utah and Wyoming. If I give blood, is there a recommended time to wait to get a tattoo? Hi Courtney, please check our general eligibility guidelines at https://rcblood.org/eligibility that includes guidance about tattoos. Thank you! Thanks for adding this page and information. For years I’ve been asking which states do/don’t regulate tattoos – because I’d happily get one while traveling vs. at home if needed. Now I know that’s the best way for me to get new tatts (I live in NY State). How long should I wait if I got my tattoo in a different country? There is already a previous comment regarding this topic and it was looked over into a link that provides no help. How long do we have to wait if we have had a tattoo OUT of country? I recently got one in Canada and would like to know the waiting period is, if there is any. Hi Faith, please call 866-236-3276 to get assistance with your eligibility question. Thanks! Why the does pa not regulate tattoo facilities!!!!!!!!!! I donate regularly and just had a tattoo and now cant donate for a year. Can you please look into this!